Made from pink and clear polycarbonate Topsy Turvy mills are practical and colourful alternative to the traditional mill design. Topsy Turvy upside down mills have the mechanism located at the top giving you mess free milling and a clean table every time. Filling is performed by simply removing the base cap - no spilt peppercorns and no spindle to get in the way. Each unit is 16½ cm high (6½ inches) and arrive prefilled with either sea salt or black peppercorns. 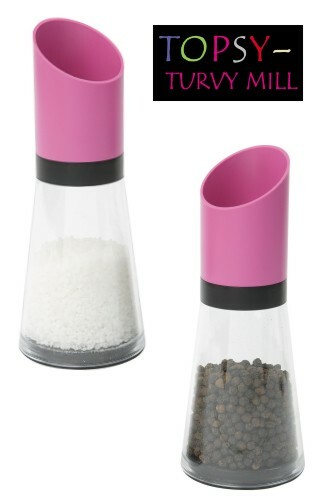 Price is for both the salt and pepper mills.